A couple of weeks ago, I posted a recipe on Facebook (do you follow me on Facebook? yes yes?) for peach cobbler, and then I realized that I wanted to do a post on it, because I have to sing about the incredible of this recipe FAR and WIDE. I'm not going to talk about it that much. There's not that much to say about it. It's one of the best things you will ever ever eat and that's that. The recipe comes from one of the best dessert cookbooks in existence, 'Lee Bailey's Country Desserts' and nearly every treat I've covered on this blog comes from that book. Hopefully right now there are some amazing peaches around you that you can get your hands on. 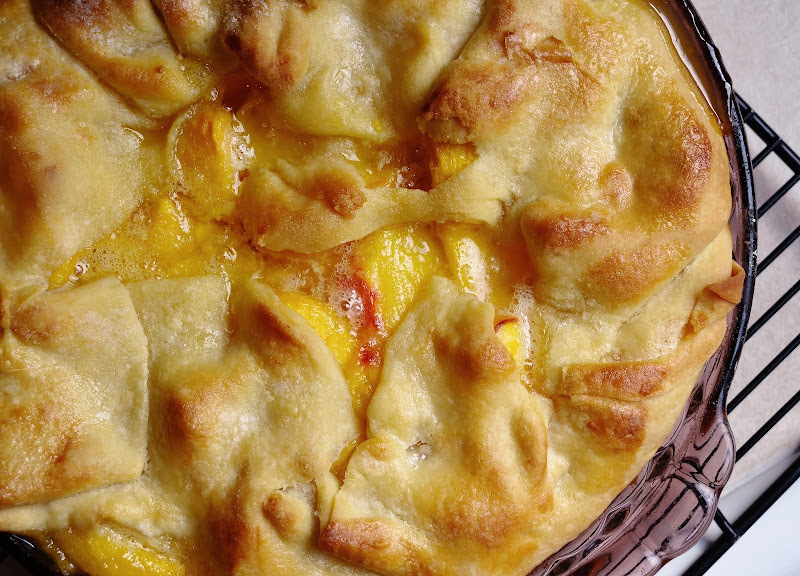 If there aren't, don't make this recipe with peaches. You must only use amazing peaches. 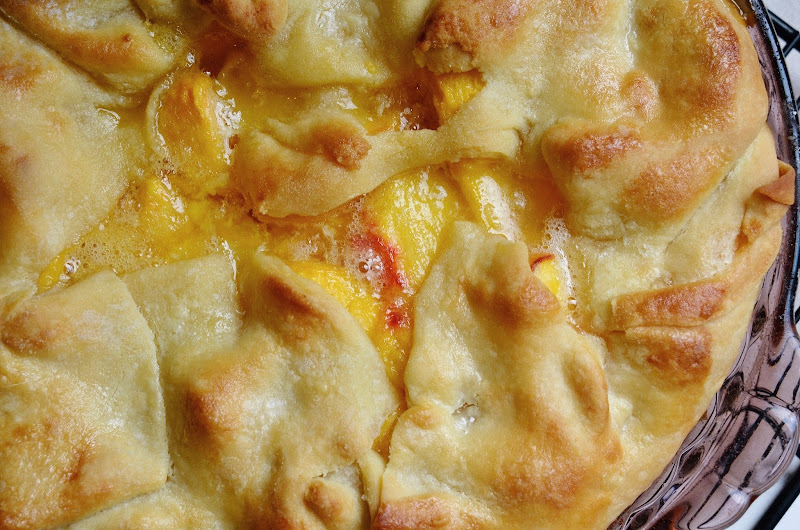 This recipe DESERVES only amazing peaches. Or really good peaches. 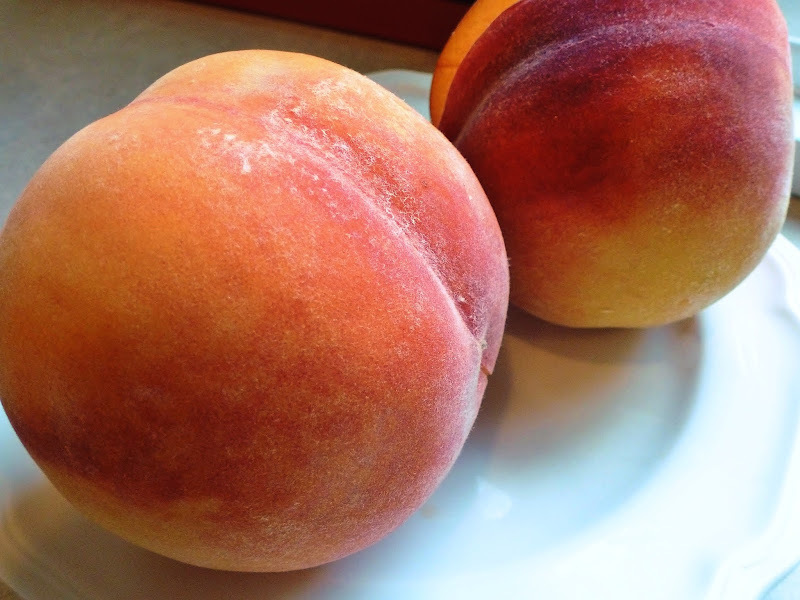 Just don't use mushy, tasteless peaches. My end of summer gift to you. "I only make this dessert during the height of the local peach season, for as you can see by the ingredients, the cobbler's flavor depends almost entirely on the flavor of the fruit." 5 tablespoons unsalted butter, frozen or well chilled, diced. Preheat oven to 450 degrees. Lightly grease a deep 7x9 inch oven proof dish. (I used a 9 inch pie pan.) Set aside. Place the flour and salt in the bowl of a food processor fitted with a metal blade. Add the frozen butter and the shortening. Process until mixture is the size of small peas. Add ice water and process until mixture begins to form a ball. Remove and shape into a ball. If you would like to refrigerate the dough at this point, (I did, for about an hour or so) flatten between 2 sheets of waxed paper or plastic wrap. Meanwhile cut the peaches into thick slices and set aside. To assemble the cobbler, roll the dough out into a large, ragged rectangle or circle, depending on your pan, on a floured surface. Dust with flour and roll back onto the rolling pin, window-shade fashion. Unroll over the prepared dish, lining the bottom and sides and allowing excess dough to hang over sides. Heap peaches into the dish. Sprinkle with sugar. (I mixed the sugar and flour into the peaches before I put them into the dish.) Dot with the butter pieces. Flop the loose ends of pastry over the top, using any pieces that might have fallen off as patches. Put cobbler into the oven and turn the temperature down to 425 degrees. Bake for 45 minutes, or until top is golden. Serve with whipped cream or ice cream, if you like. INCREDIBLE. Store any leftovers in the refrigerator to keep the pastry crisp. (My friend Danzel from Silver Shoes & Rabbit Holes is hosting the Happy Happy Lunch blog hop today, go see! Hubby is a huge fan of peach cobblers! We can never find a truly good one in restaurants. It's either too sweet or mushy. Probably a sign that I need to make my own ^_^ Is it important for the butter to be frozen? I'm not always into peaches, but for some reason, this looks AMAZING today. I feel as though now that I live in the south, I should really learn how to make a peach cobbler. This one is a good place to start! Mr. Lee Bailey was a very Southern gentleman, and the other great cobbler recipe in his book (blackberry cobbler) is adapted from Edna Lewis' recipes, and she was one of the great masters of southern cooking! Yum!! I haven't had a peach cobbler all summer. YUMMMM! I'm drooling so hard right now! Do I have to use the shortening, or can I use butter instead? you know, I'm not a pro chef or baker so I can't really surmise that accurately....I have a recipe I use quite often from The Joy of Cooking, it's called Deluxe Pastry Dough, and it used all butter, and it's quite a nice crust. So I think if you want to use all butter, you just go on ahead! However, I find the hallmark of this crust, as written, is that it's very tender and delicate, yet with a bit of crisp. Honestly, if you have a dough recipe you really love, hey, go ahead and just use that!